I can harvest and process the wax for balms and soaps and lotions, etc. I collect old frames as I have the opportunity, like during spring cleaning after boxes have been rotated and the old brood comb works its way to the top of the hive, or at the end of the season when the girls are condensed down and extra boxes and frames are collected and stored for winter. Note: You might want to keep a few old brood frames around for making swarm traps. Spring temperatures are perfect for cleaning frames. It’s still cool outside, but too cold or too hot, so the wax is soft enough to cut through, but solid enough that it comes out in chunks. I set up a table outside, collect my tools and a big plastic bin, then I start harvesting the wax and picking the frames. It’s not the most thrilling job, but carve out a few hours, pick a nice spring day, turn on some music, and it becomes one of those relaxing, zen-like tasks that’s over before you know it. 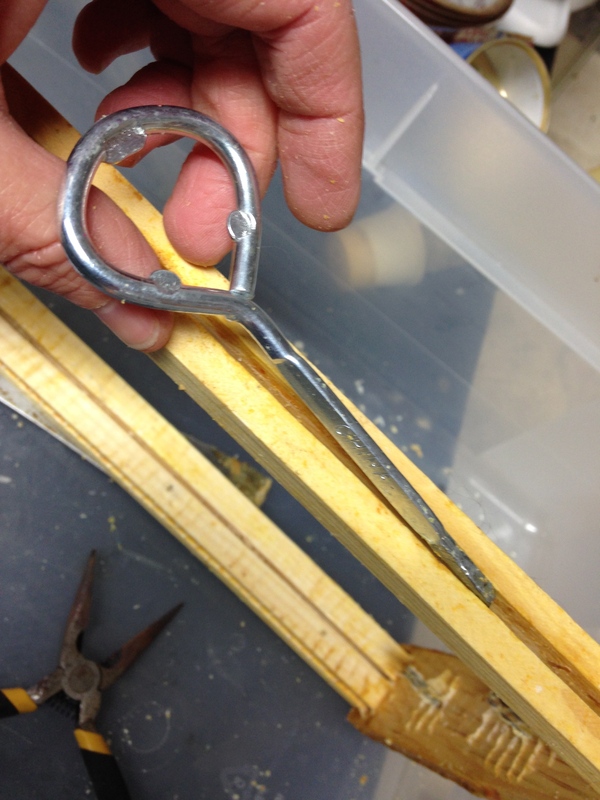 Hive tool – great for scraping wax and propylis off the surface of the frames. 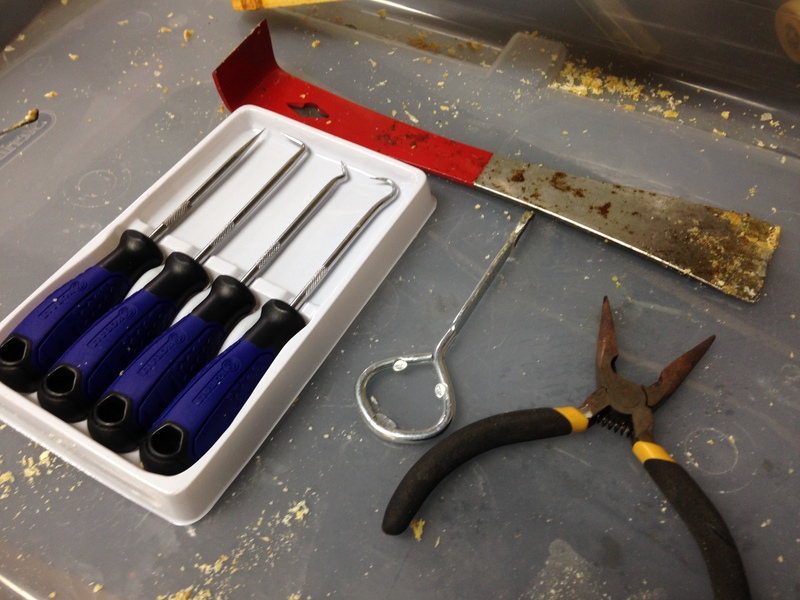 Set of stainless steel picks – from the tool section at Home Depot. Great for picking wax out of the narrow crevices. Paint can opener – the hubster filed the opener end into a V shape that fits right down into the grooves at the bottom of the frame. It’s slightly curved shape helps to lift the wax right out without splitting the wood. Palette knife – the palette knife is super thin, but still strong, so it fits down through the gully across the top. Use it to push the wax through, then run it across the inside surfaces to cut the wax out and scrape the gully clean without cutting into the wood. Soaking frames in a long, narrow plastic bin (like the one shown in the photo above) that’s partially filled with clean warm water can also soften and loosen wax, making it easier to cut through the debris and clean out the crevices. Immerse up to 4 frames in water at a time, and work on one while the others soak. This step also helps clean sticky honey and propylus from the frames – it’s a pre-soak before the final soaking step. Scraping and picking will remove most of the wax and propylus, but the frames will still bee sticky and waxy. So my final cleaning step is to soak them for 30 minutes in a hot water bleach solution. Fill an old bucket or large plastic bin with hot water and a ½ cup of pure unscented bleach. Immerse the frames and let them soak for about 30 minutes. I soak half, then flip them around and soak the other half. Give them a thorough rinse, then stand back and admire your clean, disinfected frames. The bleach solution will sterilize the frames and will eliminate any pests or wax moths. 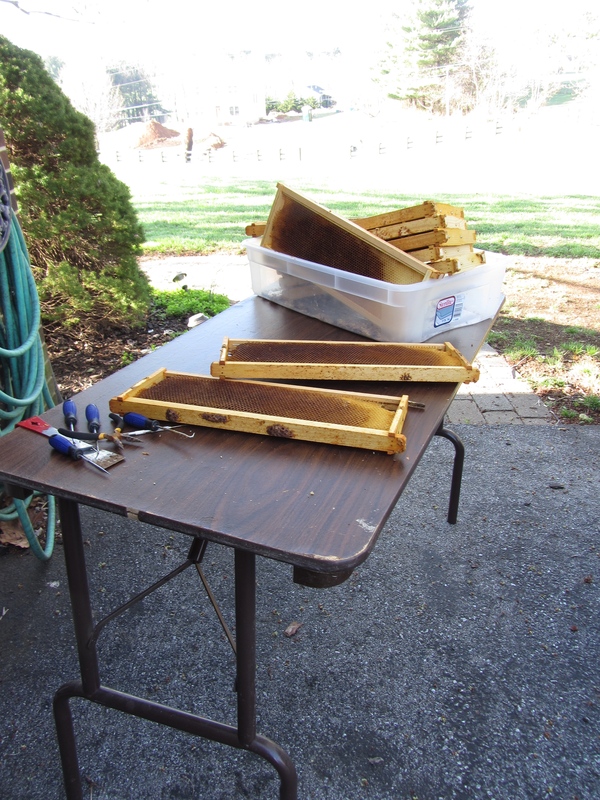 Add fresh wax foundation back into the hives so the girls can build them out and reuse them for another year or two.